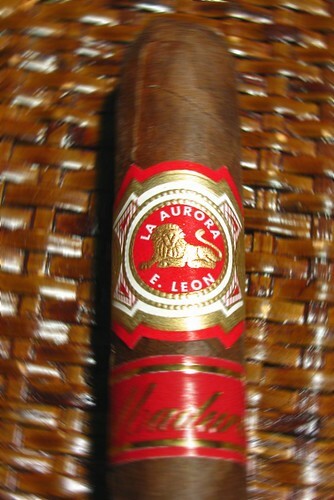 La Aurora is the oldest cigar factory in the Dominican Republic, going back to 1903. Probably best known today for its Preferidos range, made with barrel aged selected tobacco by its best torcedores, it actually produces a number of different lines. (The well-made company web-site is well worth a visit for more information). I got a couple of La Aurora cigars with a Dominican sampler and this is the first one I tried, being unable to resist the temptation of another maduro stick. The wrapper has a nice natural maduro hue, is quite toothy and is uniform in colour. A thick vein running down the cigar’s side spoils the appearance a bit. It feels quite nicely packed except for two largish soft spots about midway through its length. The start is impressive, rich and complex: very nice notes of maduro tobacco, white pepper, mocha and a sweet/fruity finish. It smokes very nicely too, from start to finish. Apart a slightly tight draw for the first 5 minutes (after which it loosens up) it has a perfect burn and decently solid white ash. The midle section starts OK, though not great, on leather and mellow spice notes but quite rapidly a tarry bitterness appears. I needed to purge the stick three times to get rid of most of the taste, but it spoiled the second section for me pretty much. Once the whole huffing and puffing to purge the cigar is done, the aromas go back to maduro tobacco and leather with a bit of white pepper… but not too long. In the last inch the cigar gets really hot and rough and I have to put it off. The way this cigar started, I was expecting a fantastic stick. Unfortunately the bitterness and overheating that came afterward really spoiled it for me. Possibly I cannot exclude I got a sub-par stick, but other reviewers (see the links below) have had issues with these too, which points to some general quality issue to my eyes. This cigar nonetheless manages a decent 81 points thanks to the great start and faultless smoking characteristics and yet this only goes to shows that points only mean so much, as I doubt I would pick up another of these in the future. Still it has shown some hints of greatness that make me curious about other cigars in the La Aurora range, especially the Preferidos and the 1495 series. This entry was posted in Cigar Reviews, Dominican, Maduro and tagged Cigar Review, Dominican cigars, La Aurora, Maduro. Bookmark the permalink. I too was a bit disappointed by this stick. The over all bitterness really spoiled this stick for me. I have one more to try but I think that this stick needs some long time aging to mellow out the harsh flavor.